SUNDAY SERVICE - from September to June takes place each Sunday morning at 10.30am. Each Service is webcast live with 30-40 regular viewers each Sunday. Prayer Ministry takes place at the front of the church after the service when, if anyone would like someone to pray with them or for them, members of the Prayer Ministry Team will be available. EASTER SUNDAY AT BALLYWILLAN - Dawn Service on Ramore Head at 6.00am; Morning Services at 9.30am and 11.30am. SUNDAY SCHOOL - for all children up to the age of 11/12 - begins at 10.50am each Sunday morning. The older age groups have their own programme and are based in the Youth Room on the Hall stage. BIBLE CLASS - for teenagers - begins at 11.30am each Sunday morning. MTT - for young people of Secondary School age (11-18 Years) - meets every Sunday evening from 7.30pm to 9.15pm. MTT (More Than This) is our main youth ministry for young people. LADIES BIBLE STUDY - takes place on Monday mornings at 10.30am in the Octagon. All ladies will be made very welcome. BALLYWILLAN WOMEN TOGETHER (BLT) - our Presbyterian Women group - meets each month during the year on designated Monday evenings at 7.45pm (coffee and tea at 7.30pm). A social event is planned for Saturday 4th May when the group will be going for afternoon tea to Aghadowey Presbyterian Church. Anyone interested please add your name to the list in the Link. All ladies will be made most welcome. PRAYER GROUP - meets on Wednesday evenings at 7.30pm on notified dates. New members always welcome. BACK TO BASICS - this group meets on Wednesday evenings at 7.30pm on specified dates. New members always welcome. COFFEE MORNING - takes place every Wednesday morning from 10.30am - new members always welcome. INDOOR BOWLING CLUB - meets every Wednesday and Friday at 7.30pm. New members will be made most welcome! PARENT & TODDLER CLUB - meets every Friday morning from 10.15am. New Mums, Dads, Guardians and children always welcome! CRAFT CLUB - meets on Friday mornings at 10.30am in the Youth Room. New members will be made very welcome! ELDER'S PRAYER TIME - takes place on the last Saturday of every month at 8.00am in the Octagon. MONTHLY NEWSLETTERS - Newsletters and Calendars are available on this website under the title RESOURCES - MONTHLY NEWSLETTERS. The Listings for April are now available. COME DINE WITH ME - the group meets once a month following a Sunday service and members have lunch at 12.30pm in Portstewart Golf Club. The April lunch will take place on Sunday 28th. For these lunches sign up sheets can be found in the Link and Vestibule. 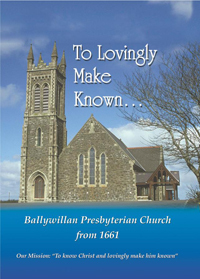 The book "To lovingly make known .... Ballywillan Presbyterian Church from 1661" has been produced to celebrate 350 years of ministry in the church. Copies to purchase are available in the Church vestibule and in the Link or by contacting the church office.